I’m on a short vacation at the moment together with my family, and I have been strictly prohibited to touch any electronic device by my wife and child. But, they are already sleeping tight right now so I’m about to make a quick post to keep you all updated on what’s been going on. I’m using this wireless broadband kit that I got recently from Smart (the leading wireless services provider here in the Philippines) to be able to connect to the Internet anytime anywhere. The connection speed is pretty decent. However, the device installer is only available for Windows and Mac. So for now, I’m stuck with Windows XP running as guest OS on VMWare. When I get this thing to work directly on my Linux box, I will keep you all updated. Speaking of wireless internet, I just read today that the 3G iPhone has been finally introduced by Steve Jobs with a new smoking hot design and at a very affordable introductory price. 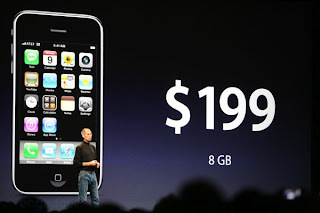 The addition of 3G capability made the iPhone an even better internet device. It is said that it will arrive here in the Philippines real soon with Globe (second largest telecommunications company/Smart’s main rival) as the official network carrier. I know that the title of this post sounds a little funny. But, I’m just wondering whether hi-tech Filipinos who want to get connected on the web all the time will still care about these wireless broadband kits when the 3G iPhones will be made available here in our country.